We are all cavemen. Oh all right – and women. Semantics aside, the point is that we are cavemen who wear a slightly better class of animal skins than our ancestors. Physiologically, we have not changed in about 60,000 years. We got our primate brains and opposable thumbs, lost most of the body hair, came down from the trees, started tool-making and then … stopped.Evolutionarily, we came to a grinding halt. Now, in evolutionary terms, 60,000 years is the blink of an eye, but in human lifespan terms, that’s an awful lot of generations. And just look at us – no wings, no hardened carapace, no naturally evolved pointy weapons. We’re still the soft, squishy, fragile little bipeds that we were when we first started playing with flint. And now we are cavemen in a recession. 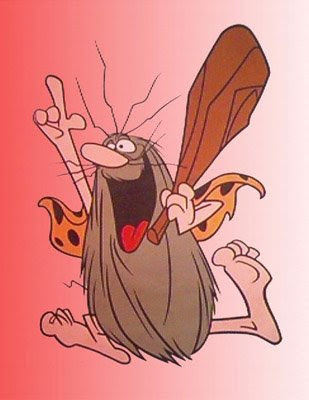 What does a recession look like to a caveman? I imagine a pre-recessionary environment where he lived in a warm, dry, sheltered cave. Nice narrow entrance – easy to protect. Plenty of roots and berries in the immediate vicinity. Fresh water supply nearby well upstream of where the animals drink. A forest to one side for firewood and open grasslands to the other for hunting. And such hunting! Bounteous numbers of docile, slow-moving bovines in visible range. On a good day, a gnu or two will even wander in front of the mouth of his cave! Now Thag [for that is his name] is lying whimpering in the mouth of his cave. The supply of meat in the cool part of the cave is dwindling and some of it is beginning to smell. He hasn’t seen a gnu, or any other bovine creature, for weeks. The last ones he saw stampeded and destroyed all the roots and berries surrounding his cave. His spear is broken and his leg was snapped by one of the stampeding gnus and he still can’t put any weight on it. This isn’t a modern cave society where the softest and weakest members of the tribe have somehow persuaded the hunters to give them the best cuts of the kill, even though they don’t participate in the hunt or really produce … anything. This is an old-school cave society where if you don’t hunt, you don’t eat. What is Thag going to do?